"We don't stop at our skin." Thirty some years ago, when I was struggling to stay alive, energy healing was one of the first approaches to play a prominent role in my recovery. It was also one of the most surprising to me as nothing in my background had prepared me for the types of changes that could occur when someone practicing this form of healing administered just light touch or even no-touch with specifically focused intention. Because the human energy system influences the functioning of the entire physiology and the psychology as well, the range of energy medicine's potential influence is quite broad . Over the years, as a recipient and as a practitioner, I've experienced blood sugar normalize, headaches and stomach aches vanish, mysterious post-surgical pain dissolve, mis-aligned bones move into place, stress dissolve, insomnia resolve, relief from kidney stone pain, and numerous other improvements. Because science hasn't yet figured out how to study the subtle energy field, and because most people in our culture have had their natural sensitivity to energy discouraged from an early age, energy medicine can seem pretty "mysterious". But results are hard to argue with and slowly but surely, as more and more people experience the benefits, energy medicine is making its way into the integrated medical system. 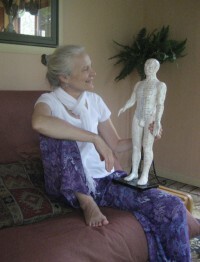 There are many wonderful forms of energy medicine. The two I practice, Jin Shin Jyutsu (a hands-on method) and Tong Ren Therapy (a distance-healing method) have even found their way into hospital settings because they have been found to be so safe and helpful to many.